Isn’t it great to come home to your whole house smelling wonderful! I guess that’s mostly why I’m addicted to my crock-pot and the fact that it’s super easy to throw a warm meal together in the morning and have it ready to eat before my kiddos fall apart in the evenings. I’ve made this recipe several times and have never been disappointed. I typically buy a 3 -4 lb. 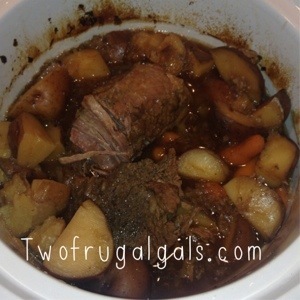 chuck roast which always seems to be enough for my family of five. But before I place the roast in the slow cooker I lightly cover the meat with a mixture of flour, garlic salt, celery salt and pepper and then sear all sides a bit with butter or olive oil (this only takes a few minutes and really helps to seal in the juices of the meat). The meat is so tender and the gravy is awesome. If you have leftovers, take the rest and add about 1 cup of sour cream, and a pound of cooked egg noodles, and 1/4 cup chopped green onions to make a simple yet different beef stroganoff. 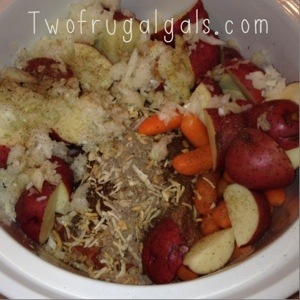 A delicious and frugal meal for any two nights of the week! Mix cream of mushroom soups, dry onion soup mix, and beef broth together. 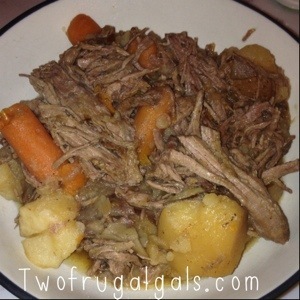 Place pot roast in slow cooker and coat with soup mixture, carrots, red potatoes, garlic and onions. Cook on high setting for 3-4 hours, or on low setting for 8-9 hours.